An extraordinary journey to the top of the world, the documentary adventure TO THE ARCTIC tells the ultimate tale of survival. 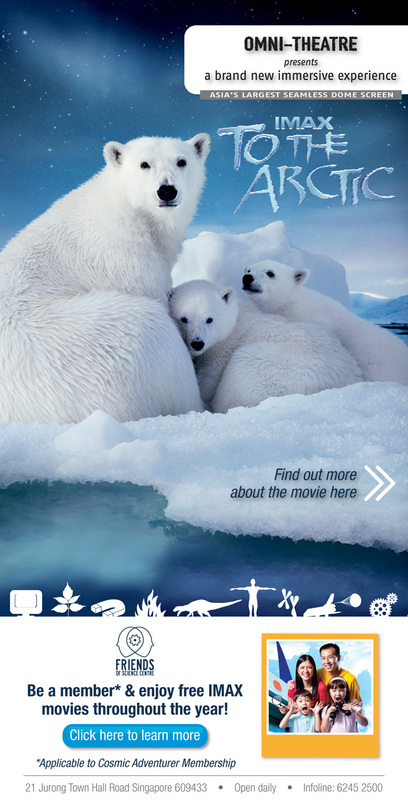 Narrated by Oscar® winner Meryl Streep, the film takes audiences on a never-before-experienced journey into the lives of a mother polar bear and her twin seven-month-old cubs as they navigate the changing Arctic wilderness they call home. Captivating, adventurous and intimate footage brings audiences up close and personal with this family’s struggle to survive in a frigid environment of melting ice, immense glaciers, spectacular waterfalls, and majestic snow-bound peaks. Find out more via www.omnitheatre.com.sg/movies77_To%20The%20Arctic.aspx. *Applicable to Cosmic Adventurer Membership.